The Australian Imperial Force, first raised in 1914 for overseas war service, became better known by its initials - the "AIF". There was a distinct character to those who enlisted in the earliest months and who were destined to fight on Gallipoli. During the war the AIF took its place among the great armies of the world, on some of history's oldest battlefields. The Australians would attack at the Dardanelles, enter Jerusalem and Damascus, defend Amiens and Ypres, and swagger through the streets of Cairo, Paris, and London, with their distinctive slouch hats and comparative wealth of six shillings per day. However, the legend of the AIF is shrouded in myth and mystery. Was Beersheba the last great cavalry charge in history? Did the AIF storm the red light district of Cairo and burn it to ground while fighting running battles with the military police? Was the AIF the only all-volunteer army of World War I? 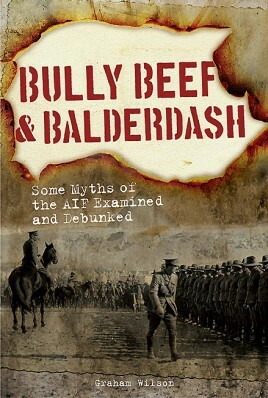 Graham Wilson's Bully Beef and Balderdash shines an unforgiving light on these and other well-known myths of the AIF in World War I, arguing that these spectacular legends simply serve to diminish the hard-won reputation of the AIF as a fighting force. Graham Wilson mounts his own campaign to rehabilitate the historical reputation of the force and to demonstrate that misleading and inaccurate embellishment does nothing but hide the true story of Australia's World War I fighting army. Bully Beef and Balderdash deliberately tilts at some well loved windmills and, for those who cherish the mythical story of the AIF, this will not be comfortable reading. Yet, given the extraordinary truth of the AIF's history, it is certainly compelling reading. Graham Wilson served 26 years in the Australian Regular Army, retiring in 1996 as a Warrant Officer Intelligence Analyst. Following five years as a civilian intelligence officer in the Department of Defence, he transferred to the Defence Department’s Directorate of Honours and Awards where he worked for 10 years in the support and policy areas; the latter as Staff Officer Historical Research. Graham retired from the Public Service in February 2011 and now works as a historian.Graham is active in a number of historical and militaria societies and is a prolific author of historical articles; he has been published in Australia, New Zealand, the UK and the USA and has received a number of awards for military history writing.. Graham lives in Canberra with his wife Sharon, a retired Chief Petty Officer of the Royal Australian Navy, and their Bichoodle “Ralph”. Their favourite pastime is spoiling their grandchildren.